GE Intelligent Platforms has released the WANic 6354 intelligent high performance packet processor designed for demanding high volume IP network applications. Key advantages enabled by the new high performance packet processor include greater network throughput, security and manageability. Based on the latest multi-core Cavium OCTEON II CN6335-AAP application accelerator processor, its combination of advanced technologies allows for higher speed networks and for the inclusion of advanced security functionality in those networks. With its comprehensive development package designed to minimise time-to-revenue, the WANic 6354 delivers a sustainable competitive advantage to customers. The range of network applications in which the WANic 6354 IP packet processor can be deployed is extremely broad and includes session border control, secure access, network address translation (NAT), traffic management, firewall, deep packet inspection (DPI) and lawful intercept, secure IP communications, encryption, packet filters as well as network monitoring and testing. “The rapid growth in search engines, cloud computing, Internet-based retailing, Web 2.0, mobile devices, online gaming and so on are driving network traffic at an unprecedented rate,” said Rubin Dhillon, Global Director of Communications Product Management at GE Intelligent Platforms. The alternative would see customers needing to add more general processor computing in the form of server blades, appliances or rack-mount servers. Offloading the traffic processing to the WANic 6354 therefore provides substantial cost savings to many applications. Support for IEEE 1588 and hardware timestamping are provided by the WANic 6354 for Ethernet synchronisation and packet ordering. This is of particular significance for networks in which voice and video are being transported, and to customers involved in monitoring and evaluating Ethernet traffic as it facilitates reporting flow/ timing details for the network being monitored. 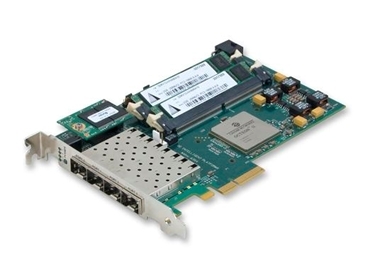 The WANic 6354 supports high-speed communications via a 4-lane PCI Express Generation 2 bus interface to the host. Four front panel line interface ports with SFP connectors support IEEE 10/100/1000BaseT Gigabit Ethernet as well as short- and long-reach optical connectivity. The 4 Gbits/second line-speed packet processing performance for Layers 2-7 of the WANic 6354 is made possible via its use of a number of advanced technologies. These include its MIPS64 Gen 2 processing cores, the implementation of high performance I/O bridging and queuing, its high speed internal connectivity as well as its advanced memory technologies.